Some emerging technical vocabulary is so self explanatory that it requires almost no definition! 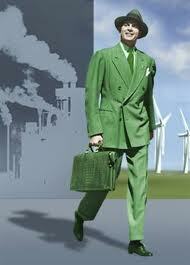 So it is with the concept of a “Green Collar” worker. 1976, Patrick Heffernan, “Jobs for the Environment — The Coming Green Collar Revolution”, in Jobs and Prices in the West Coast Region: Hearing before the Joint Economic Committee, Congress of the United States, Ninety-Fourth Congress, Second Session, U.S. Government Printing Office, page 134. Another Wikipedia reference credits Patrick Heffernan as well. All Words.com also credits Patrick Heffernan. It seems to be Patrick Heffernan, way back in 1976 already.